Do you or your children play any of the following sports? Soccer, basketball, squash, football, rugby, hockey, boxing, gymnastics, skateboarding, martial arts, skiing or volleyball. What would happen if you or your child got hit in the mouth or jaw? Mouth guards are resilient appliances that fit over your teeth. When worn during sports activities, they help protect against injuries to the teeth and areas in and around your mouth. Although the number of mouth injuries caused by sports activities is relatively low, the cost of these injuries can be relatively high, especially if there is damage to the teeth. How can a mouth guard protect you? There are two main goals in wearing a mouth guard for active play, organized or not. The first is to protect teeth against the impact of an object or body part. When you are hit in the mouth or jaw, a mouth guard acts as a cushion that redistributes the force of the blow, so the impact is absorbed more evenly. Second is to protect against concussions. A blow from an elbow or implement transferred through the mandible and into the skull can cause severe damage, not just broken teeth. Choosing the Right Mouth Guard! Mouth guards vary in terms of cost, comfort and effectiveness. 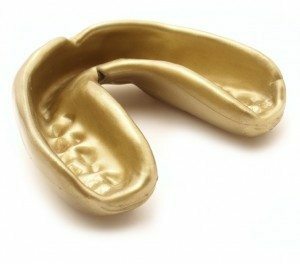 The ideal mouth guard is durable, resilient, and comfortable. A mouth guard should fit properly, be easy to clean and should not affect your ability to speak, swallow or breathe. There are two types of mouth guards: Custom-Fitted and Store Bought. Custom-Fitted mouth guards are more expensive but they have a better fit, which means better protection and more comfort. They are prescribed and fitted by a dentist. The process involves making a model of your teeth and then moulding the mouth guard material around the dental model to ensure a close and comfortable fit. And let’s face it, if it isn’t comfortable, you’re not going to wear it. They also come in fun colours! As the sporting season approaches, think safety and invest in a custom-fitted mouth guard for yourself or your child. Protect yourself and your children by using an athletic mouth guard when you take part in activities that pose a risk of injury to your mouth. It’s a smart investment that can provide valuable insurance against injuries that could cost much more in the long run. Please feel free to speak to our dental team for advice about choosing the right mouth guard for you and your children.